Tripp Lite's 3M (10-ft.) Ultra Thin Toslink to Mini Toslink Digital Optical Cable provides the ultimate in pure, digital audio quality. Using superior grade optical fiber, and precision polished optical connectors, Toslink cables offer a clean signal at even the most extreme volumes to give you a detailed, rich sound. Constructed of Ultra Thin cable, it's ideal for situations where space is at a premium. Tripp Lite’s Ultra-Thin Toslink Digital Optical Cable delivers the best in audio clarity. This cable is ideal for connecting home theater and stereo components when your connection requires a male Toslink connector on one end of the installation, and a male mini-Toslink connection on the other end. 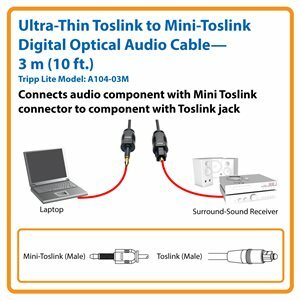 Use for laptop computers, portable digital audio equipment and any other devices with a mini-Toslink jack. Choose ultra-thin cable when space is at a premium or you want to easily tuck cables out of sight. Use to connect equipment up to 3 m (10 ft.) apart. For connections up to 2 m (6.6 ft.) or less, choose Tripp Lite’s A104-02M cable. Using superior-grade optical fiber and precision optical connectors, Tripp Lite’s Toslink cable offers a clean signal, even at the most extreme volumes, to give you rich, detailed audio. The precision polished optical terminals minimize loss for better high frequencies and a more realistic stereo sound. Unlike traditional copper cabling, digital optical cables eliminate distortion caused by inductance, capacitance and resistance. They are also immune to the electromagnetic and radio-frequency interference caused by electronic equipment found in virtually every home and business – interference that will degrade the quality of your audio and video. For peace of mind, the A104-03M cable is backed by a lifetime limited warranty. This cable is manufactured in compliance with strict RoHS specifications, reflecting Tripp Lite’s commitment to environmental responsibility.